Johnson & Johnson recently announced that by 2015 it will rid all of its personal-care products-for both children and adults-of a series of chemicals, including preservatives that release formaldehyde. Parabens, which are also preservatives, will be removed entirely from kids' products, and from many, but not all, adult products. Johnson & Johnson is the first beauty company to take such actions; items in the Neutrogena, Aveeno, and the Clean & Clear lines will be affected. A company vice president reiterated the safety of the products currently on the market, and said that Johnson & Johnson is merely responding to consumers demand for products free of these chemicals. You may recall that formaldehyde is the controversial ingredient in many Brazilian Blowout formulas, prompting FDA-intervention, bans in Canada and California, and a hazard alert by the Department of Labor Issues, which was were concerned about salon employees coming into repeated contact with high percentages of the chemical. To find out more about what the change at Johnson & Johnson means, we talked to cosmetic chemist Ron Robinson. Realisitically, would the amount of formaldehyde, dioxane, or parabens currently in personal care products harm us? "No. They wouldn't. I've looked into research on this. The levels are so small-it's really parts per million-and would not have any effect. There was a study in which parabens were found to mimic estrogen causing breast cancer, but these were a much higher levels than are typically found in cosmetic products and the study was later found to be flawed by the American Cancer Society and other researchers. That study created a little bit of a scare amongst some consumers. I think [Johnson & Johnson] is reacting to that [consumer reaction]. Since they also have products for kids, and this is a very sensitive subject for a lot of parents, [Johnson & Johnson] made this decision to pull it out across the board." These parts of a million in our products-over time if we're re-using and re-using them, they won't build up? "These products are rinsed away. All studies show that we are safe with continuing to use these ingredients as preservatives." Will removing any of these preservatives change our products? "There are other alternatives that can be used, which won't change the way our favorite products work. It has been a challenge for some of these manufacturers but they've been able to find good alternatives." Formaldehyde specifically makes people nervous because of the Brazilian Blowout dangers. How is the formaldehyde released from the preservatives in these products different from the formaldehyde in Brazilian Blowouts? "It's apples and oranges. There are higher levels of formaldehyde in [the Brazilian Blowout products], but also, when you move with the flat iron and the blow dry, you're re-releasing those high levels into the air where people can breathe them. You're going to have much lower levels in topical application versus inhalation, which is what happens during a blowout and is a much, much bigger concern." Is there anything else we need to know about these chemicals? "Some of the formaldehyde-releasing preservatives can be somewhat irritating to children, to infants' skin. So certainly, if there's any irritation being caused by these ingredients, you might want to try those products without these preservatives. And that could be a message for people who have sensitive skin too." 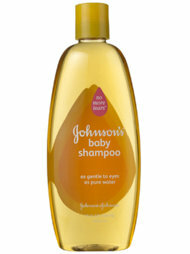 What do you think of Johnson & Johnson's plans?